These stats tell us a couple of things. First, shareholders and companies were more likely to enter into a constructive discussion about the issues at hand. As a result, the number of shareholder proposals withdrawn by proponents increased. Second, shareholder support for social and environmental proposals is growing in the US. This is likely due to greater awareness among large institutional investors such as pension funds, about the materiality of environmental and social issues (we have the United Nations Principles for Responsible Investment to thank for that). In addition, more proxy voting advisory firms are voting in favour of key social and environmental resolutions. SI2 noted that proxy voting giant MSCI (formerly ISS) recently voted in favour of 65% of all social and environmental proposals submitted by shareholders, a major increase from just a few years prior. Unfortunately MSCI's smaller rival Glass Lewis only voted in favour of 15% of shareholder proposals. What's on the ballot for the upcoming year at US companies? Shareholders continue to push for greater accountability on political spending in 2011. Investors are leading a creative campaign that targets companies that sit on the Board of the US Chamber of Commerce, asking them to rethink their board membership. Shareholders argue that there is a problematic misalignment between the policies of companies that sit on the board, and the Chamber's aggressive and partisan political lobbying (particularly on issues such as climate change). Its a fascinating shareholder issue, and one I'll be watching this year. Other issues for 2011 include proposals seeking more disclosure from banks about risks related to foreclosures and mortgage lending. Wells Fargo, Bank of America, JP Morgan and Citigroup are facing questions about the checks and balances in their lending practices. 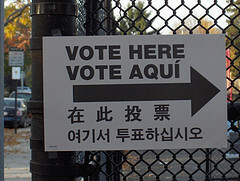 Proposals asking companies to adopt sexual orientation non-discrimination policies will also hit the ballots this year. And shareholders will be voting on board diversity proposals that call for more women and ethnic minority candidates to be nominated for director positions. Finally, US ballot items will also include proposals on climate change, palm oil, hydraulic fracturing, off-shore drilling safety, toxic chemicals, human rights, net neutrality, and worker health and safety. Canada's proxy season is shaping up to be much quieter than our neighbours to the south. To date there are 60 recorded shareholder proposals filed at Canadian companies. The vast majority of the proposals (40) were filed by MEDAC on issues such as gender parity on Canadian boards, tax havens and executive compensation. There is no doubt that following the financial crisis, executive compensation is the big issue this year. No fewer than thirty-one proposals were filed asking companies to review executive compensation practices, which means this will be the issue to watch over the next few months. Some others will be interesting to watch as well. IA Clarington Inhance filed proposals on the issue of free, prior and informed consent of indigenous peoples at four companies (Teck Resources, Bank of Nova Scotia, Toronto Dominion Bank, and Royal Bank of Canada). In 2009, Bâtirente and RRSE filed a shareholder proposal asking Talisman Energy to prepare a report outlining the benefits and costs of adopting an FPIC policy. This led to Talisman agreeing to prepare a groundbreaking report, which was published in mid-2010. IA Clarington appears to be following this lead with two of its FPIC proposals this year. It has also filed proposals with Encana on hydraulic fracturing, and with Enbridge regarding the controversial Northern Gateway Pipeline Project, which faces numerous challenges as it snakes its way through dozens of separate indigenous territories. Meritas Mutual Funds has filed six proposals on the 'say on pay' issue, asking companies to give shareholders an annual vote to approve executive compensation. Meritas has been leading the say on pay issue in Canada since 2008. The team at NEI Investments has filed only four proposals this season, focusing on executive compensation (Bank of Nova Scotia, Toronto Dominion Bank and Laurentian Bank) and climate change (Great West Lifeco). Finally, for the first time, a prominent US shareholder advocate, Trillium Asset Management, filed a shareholder proposal north of the border with Royal Bank of Canada. The proposal asked the bank to disclose the risks associated with financing oil sands expansion in the Alberta boreal forest. Trillium withdrew the proposal prior to the company's annual general meeting on March 3rd after reaching an agreement with the bank. Overall, the proxy season in Canada will be quiet compared with past years. Many of the active investors in Canada, such as NEI Investments and Meritas Mutual Funds, have filed fewer proposals this year, opting for constructive dialogue with companies instead. This is a welcome sign, likely an indication that progress is being made behind the scenes. Increasingly, companies are open to considering changes proposed by shareholders, and are willingly participating in discussions and dialogue addressing challenging issues. This openness to constructive engagement can be a win for responsible investors, demonstrating that even minority shareholders can exert influence without resorting to public proxy confrontations. A modified version of this blog was cross-posted on SRI Monitor, check it out! It was also cross-posted on socialfinance.ca.